The Ten of Pentacles deals with permanence and satisfaction. The card shows that everything you have put your efforts into for a long time will pay off in the future. It suggests that everything will work out well in the end - for you have always kept the long term picture in view, choosing to take no shortcuts. Your legacy is sure to stand for quite a long time to come. This is a relief, for the path to get here has been filled with setbacks and challenges, making this point of the journey even sweeter. Your legacy is sure to stand for quite a long time to come. In the card, the aged man is able to sit back and relax while watching the lives of his children and grandchildren. The satisfaction he derives from his achievement is interwoven in his children s happiness. The meaning of the Ten of Pentacles also relates to the happiness that you experience because you have planted many seeds of happiness and shared in the lives of others, particularly family members and relatives. It points to the importance of these people in your lives. The Ten of Pentacles symbolism is rooted in both financial success and stability. It shows affluence and lack of financial struggle. It also implores you to make decisions that will not only have positive results in the present but also in the long term. The decisions that you make should produce positive results that last for generations to come, trickling down to your offspring as well. 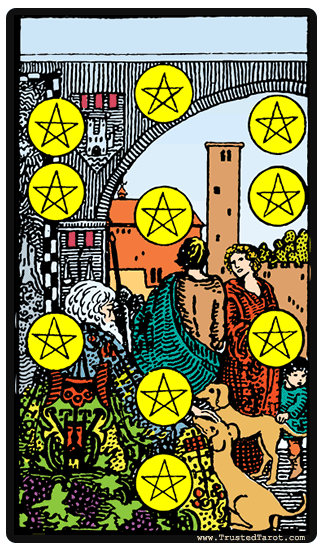 The Ten of Pentacles reversed meaning may be a warning about your future financial status. It could point to problems and hiccups later on in life, even though they may not currently be an issue. It could also show the faulty nature of an investment that you have put a lot of time and effort in. In general, this reversed card seems to signal that you are placing too many bets on your short-term success, while harming your long-term potential. Take a step back and evaluate whether your decisions right now will lead to more damage in the future. The Ten of Pentacles reversed meaning can also deal with relationships. It could show the sudden end of a marriage that has been going strong for years. It could also show that you have hit a rough patch, but there is still hope for things to get back on track. For those who are single, it could point to the fact that some of your relationships have been great for short term fun, but lack the substance to lead to lifelong commitment.